Item4 - 6. Lisgar St. Looking North Sudbury, Ontario - Robert Brown Ltd - Duplicate Benjamin Film Labs. Item5 - 11. Residential District Overlooking Lake Ramsey with Gen. Hosp. at right Sudbury. Israel "Irving" Steinberg was born January 16 1919 in Peterborough Ontario. Shortly after his birth he moved with his parents, Joseph and Leah Steinberg and his sister Rose Steinberg, to Sudbury Ontario where his father founded Toronto Bargain Stores. The Steinbergs lived in Sudbury until 1932 when they moved to Toronto. Joseph Steinberg died on July 14 1963, and Irving Steinberg as executor of his estate retained property in Sudbury until 1968 when it was expropriated by the city as part of a downtown urban development project. Irving Steinberg passed away on March 1, 2011. Earl Levi recieved the slides as power of trustee for Irving Steinberg. He gave the slides to Charles Levi who donated them to the archives. 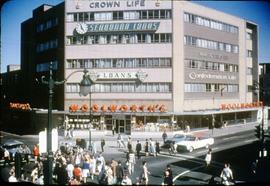 Colour slides depicting various sights in and around Sudbury in the late 1950s and early 1960s. Some of the slides are numbered suggesting they were part of a larger slideshow on Sudbury. Slides may have been collected to support claims related to the city expropriation of properties on Borgia Street in the 1960s. Slides were produced by various studios in Ontario. Steinberg sous-fonds, Levi/Smith/Weinstock/Steinberg papers in possession of Charles Levi, 2009.